Google Small Business: Learn from other AdWords advertisers in the AdWords Community! 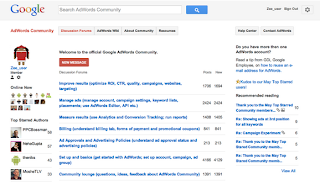 Learn from other AdWords advertisers in the AdWords Community! , has been a place for for all kinds of AdWords users (from small businesses to bigger advertisers) from all over the world to come together and exchange ideas, advice and stories with other AdWords users. It's really inspiring to see people sharing their best practises, pointing each other to resources, and enthusiastically helping those who need it. But the AdWords Community is more than just user discussions; you can find insightful articles (so called “AdWords Wikis”) written by expert users. You can learn more about the some of the community members, such as the Top Contributors, and what it takes to become one. 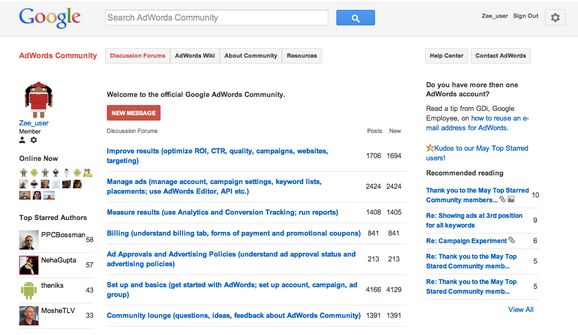 And you can get some reassurance that the Google AdWords Community team is not just a bunch of robots. But instead of taking our word for it, why don't you go and find out for yourself! If you'd like, go ahead and leave us a comment by clicking on the "new message" button directly on the forum. We are looking forward to see you in the Community! Note: Currently, the AdWords Community is also available in the following languages: French, German, Spanish, Portuguese, Russian and Italian. Since its launch in mid-February 2012, the (still-new) AdWords Community, has been a place for for all kinds of AdWords users (from small businesses to bigger advertisers) from all over the world to come together and exchange ideas, advice and stories with other AdWords users. It's really inspiring to see people sharing their best practises, pointing each other to resources, and enthusiastically helping those who need it.